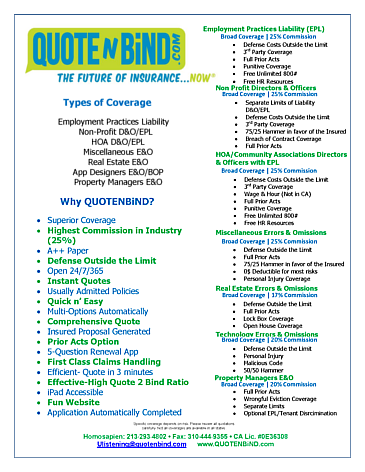 QUOTENBiND.com is an online quoting website for retail brokers to obtain superior coverages for their clients at very affordable premiums. And 25% commission. Backed by an A+ XV paper and excellent claims servicing, agents can access 24/7 and within minutes get a bindable proposal with numerous options and completed application. It is The Future of Insurance... NOW®.